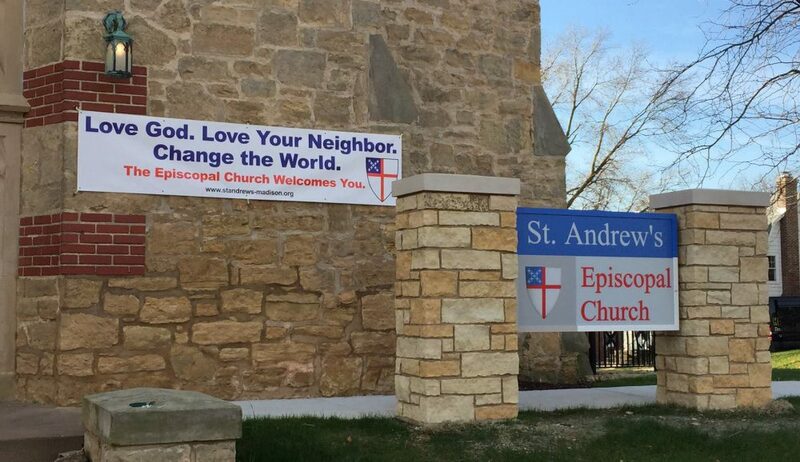 An Episcopal Priest serving Saint Andrew's Episcopal Church in Madison, Wisconsin. This sermon, offered by The Rev. Andy Jones and St Andrew’s Episcopal Church in Madison Wisconsin on December 16, 2018, is built on the readings for the Third Sunday in Advent in Year C of the Revised Common Lectionary. Good news? Really? John the Baptist is out here in the wilderness calling people vipers, talking about the wrath that is to come. He’s telling us that there is an ax lying at the root of our ancestral tree and that the Messiah is coming with a winnowing fork in hand, to burn the barren branches and the chaff with unquenchable fire! That doesn’t sound much like good news to me! But people are flocking to him, anxious to hear what he has to say! Why? That must be it because John asks us, “Who warned you to flee from the wrath to come?” Are you serious? You did John! And you’ve got us scared to death! That’s why we’re here! We are afraid! But that doesn’t sound right… does it? I mean… I hope that we aren’t here because we are afraid. We’re not afraid… Are we? No. We’re not afraid. We came her for the Good News and there must be some of that in here somewhere… right? Yes! There is… There is good news in this story. And John has got it right! We need to prepare! There is one more powerful than John who is coming to baptize us with the Holy Spirit. John is right! God is about to fulfill God’s promise. The Messiah, the Christ, is coming into the world, and that is Good news! Luke is right when he says that this is good news! John has it right! But I have to tell you that that there is even better news in the fact that John… has some of it wrong! John thought, and so did pretty much everyone else, that the nation of Israel was suffering because they had failed to follow God’s law, because they had sinned in the eyes of God. And John was sure that the Messiah would come with power, great might, and seething with wrath. An ax lying at the root of the ancestral tree, chopping off the barren branches and dead wood, saving the wheat and burning the chaff with unquenchable fire… This was how people believed God would intervene in the world, how God would make things right. This was how people believed that God would help and deliver God’s people. But John didn’t understand some of the prophets who came before him. So the people weren’t prepared. We, none of us, were ready to believe that the Messiah, God Among Us, would come into the world naked, bloody, crying, cold and shivering in the night air; not in a royal court, but in a manger, among the animals, defenseless, dependent on us… given into our hands… a child. No wrath. No ax. No unquenchable fire. If we’re not here asking “What then should we do,” if we’re not here because we are afraid. Why are we here, in the wilderness with John? Those words convey urgency, they reflect desire, they speak of longing. Jesus Emmanuel, God Among Us, came into the world and offered us something unimaginable, the opportunity to experience, to participate, in a life colored by, infused with, the love of God… life eternal. If only, if only we could live and move and have our being in God and experience that life that Jesus offers us. “Whoever has two coats must share with anyone who has none; and whoever has food must do likewise” (Luke 3:11). Cultivate a sense of abundance by giving some of what has been given to you to those who have not. You’ll be amazed by the way it feels to give without expectation of return. Give out of love, give for giving’s sake and you will get a taste of the life God dreams for you. “Collect no more than the amount prescribed for you” (Luke 3:13). Insist that giving for the common good benefits those who need it most, doesn’t become a burden on those who have the least to give, and that what is given to provide the things we all need isn’t used to enrich the few, but to care for the many. Give the needs of the community the same priority that you give your own and you will be taking the first steps in realizing the life for which you long. “Do not extort money from anyone by threats or false accusation, and be satisfied with your wages” (Luke 3:14). Work to make your justice blind, equitable, fair, and be sure that it is shaped and informed by God’s love, mercy, and grace. It really is good news! Jesus is coming to show us the unimaginable, a life lived in communion with, reconciled with, God, one another, and with ourselves. It can be awfully hard, seeking and serving Christ in all persons and respecting the dignity of every human being, loving our neighbor as ourselves. And sometimes it feels like too much, an overwhelming task, to strive for justice and peace among all people, respecting the dignity of every human being. God is coming into the world to help us to realize, experience, live and move and have our being, wrapped in the truth and light of God’s love! This sermon, offered by The Rev. Andy Jones, on December 2, 2018 at St Andrew’s Episcopal Church in Madison, Wisconsin, is built on the readings for the First Sunday of Advent in Year C of the Revised Common Lectionary. What will it be like? What will it be like when God intervenes in the world? How will it come to pass that we all finally understand without a doubt that God loves us unconditionally? How will we discover that we really are bound to one another, brothers and sisters responsible for loving and caring for our neighbor? What will finally cause the powers of this world, the people, the governments, the systems, that oppress God’s children, stealing their liberty and exploiting them for their own selfish needs… what will finally cause them to reexamine themselves and to become life giving instead of life taking? So painful that we might be tempted to turn away and dismiss it all as a fairy tale. But we, the church, do an interesting thing in Advent. We don’t turn away. We don’t try to escape or deny our sense of longing. We embrace it. We enter into it. We actually take steps to heighten it, in order to make us lean ever more fully on hope: hope for that moment when all things will be made new, when we will all be restored to one another and to God in Christ Jesus. To that end we’ve emptied the crèche, taking out the animals, shepherds, Maggi, even the Baby Jesus; all in an attempt to find ourselves in that same place of deep longing and desire for deliverance, that the people of Israel experienced under the oppression of Roman rule. We’ve taken away the flowers. We’ve removed the altar frontal; all in an attempt to find ourselves in a world where the coming of the Christ is still just a prophecy, a rumor, a promise. What happens, what does it feel like, in a world like that? Here today, from the darkness of Advent that we have entered, we look at the world around us and we long for God to do something, to do anything, to rescue us, to change the way the world moves, to bring God’s dream for creation to fruition. We wait and we cry, “how long O Lord? How long?” And we hope and we pray for deliverance. But just what is it that we are hoping for? What will that deliverance be like? And how will that deliverance come? Hard to imagine isn’t it? Our vision has been so distorted that we can’t even see the pain on the faces of the people around us. We are so inured to the way that things are that we can’t even see the faults that lie at the root of the mess in the world around us. We are so used to life in the status quo that it is hard to imagine life in the kingdom. The life that God offers, that God calls us to; that life infused with, colored by the eternal… has become almost unimaginable. And then, as if that life itself weren’t hard enough to imagine… it’s even harder to imagine how that promise, that vision might become a reality! We watch the news and we see how hard those with power work to keep their influence and control. We see people inflicting terrible cruelty and pain on one another in the effort to further their own agenda, to spread their influence, and to gain more power and control. We see people casting aside their integrity, their credibility, their center, in order to further their own ego, and perpetuate their epic, mythical, self-image. It is hard to imagine anything that would turn this mess around. What could possibly happen to change things so dramatically? It is… truly unimaginable. If we are brave enough to tell someone what we’re doing, if we’re brave enough to tell them that the Advent Wreath is marking time as we hope and pray… they might just ask us what it is that we are hoping and praying for. They might just ask us for an account of the hope that is in us. They might just ask us to describe the unimaginable. If someone asked, what would we say? What would we tell them? Maybe if we were to attempt to describe the unimaginable world we are waiting for, we would use equally unimaginable words. as the waters cover the sea”(Isaiah 11:6-9). Wolves and lambs, leopards and kids, lion and fatling, adders and asps… and a little child shall lead them? Those are pretty unimaginable images aren’t they? But perhaps that is the best that we can do in our effort to describe something that is as unimaginable as the world God imagines for us all. Perhaps the best that any of us can do in our attempt to describe unimaginable things is to use unimaginable words. If that’s what it will look like, “no one hurting or destroying on God’s holy mountain,” how do we think that will come about? How will it happen? What will cause the changes in the way that the world works that would allow that vision to come to reality? It would have to be a pretty dramatic event, or series of events, for those who hold the reigns of power and authority to bend and give enough to make room for God’s dream for us. “There will be signs in the sun, the moon, and the stars, and on the earth distress among nations confused by the roaring of the sea and the waves. People will faint from fear and foreboding of what is coming upon the world, for the powers of the heavens will be shaken. Then they will see ‘the Son of Man coming in a cloud’ with power and great glory” (Luke 21:25-27). Jesus was one of a long line of Hebrew prophets who knew how to use unimaginable words to describe unimaginable events. Were these unimaginable words ever meant to be taken literally, as blow by blow accounts of the way things would happen? They were poetry, they were hyperbole, they were spoken to impress upon us the incomprehensible magnitude of those events and the change that they would bring. Again and again, the prophets use unimaginable words to describe unimaginable events that we have to work and struggle to get our minds around. Today is the first day of Advent! And look, the crèche is out, the frontal and the flowers are off the altar, the color is blue, and we have lit the first candle of the Advent wreath. That’s just what we need; something familiar, comforting, tangible, real; something to help take our minds off of the unimaginable realities that have become our daily lives! But you know… maybe we had better take a few minutes to talk about the baby in the manger,The incarnation, Emmanuel, God Among Us. How would we explain that this same God, in these last days sent Jesus, to be incarnate from the virgin Mary, to be the savior and redeemer of the world? Really? God, a slave, humbled, obedient even to the point of death on a cross? That sounds pretty unimaginable doesn’t it? God, holy and pure, creator of all that is coming to be with us in the midst of our pain, where we waste away dragging around the chains we have forged in life? Unimaginable words to describe unimaginable events that we have to work and struggle to get our minds around. Unimaginable… Who would dare to use such words, much less dare to believe them? And yet we are a people bound together and formed by these unimaginable words. We dare to imagine. We dare to believe. We dare to proclaim the truth of these stories. We believe that God has intervened in the life of the world, that God came to us in the person of Jesus Christ and changed everything. We dare to hope, to believe, that God will prevail, that Christ will come again. And that the kingdom that was ushered in when Christ came among us will someday come to fruition and be completed. We dare to believe that we will all finally understand without a doubt that God loves us unconditionally, and that we are bound to one another, brothers and sisters responsible for loving and caring for our neighbor? And so, here in Advent, we choose to wait in the dark, not in despair, but in hope, longing for, believing in, trusting in the unimaginable…. This sermon, offered by The Rev. Andy Jones on October 28, 2018 at St. Andrew’s Episcopal Church in Madison, Wisconsin, is built around the readings for Proper 25B in the Revised Common Lectionary. Bartimaeus the name literally means out of Timaeus, Timaeus’s son. Bartimaeus was there by the side of the road from Jericho to Jerusalem, positioned in an ideal and strategic location, hoping to capitalize on the pious feelings and attitudes of pilgrims on their way to Jerusalem, so that he could get them to give him alms, to support him. That was important because as a blind man he was unable to work, and to support himself, to care for himself. I think it would be appropriate to imagine him in rags there by the side of the road. We don’t know if the he was cast out by his family or if they had abandoned him, but it’s likely. And we do know that the crowd responded to him very negatively. When he started to shout for Jesus’s attention they urged him strongly to be quiet, perceiving him as a nuisance and not as a member of their own community. So Timaeus’s affliction’s, his inability to see, has cost him quite a bit. He is alienated from his people, from his community, from his family. They probably all believed that some sin of his own, or some sin of his parent’s, or his parent’s parents, were the cause of his blindness. And so he may well have been alienated, in some ways, from himself; having received this message and this judgment from others, day after day, there in the dust, at the side of the road. Given all of that I think it would be easy to hear Bartimaeus’ is plea to Jesus, “Teacher, let me see again,” as “Teacher, reconcile me once again to my own, to my people, to my family, to myself, and to my God.” We also might hear it as, “Remove from me this affliction that has cost me so much.” Bartimaeus says let me see “again” so I think we can assume that he had been able to see. Something had happened and now he could see no more, and he was asking to be restored to that original condition. Yesterday afternoon, as I pondered this reading, it was my plan is to come in here this morning and to ask us all what it is that keeps us from seeing; what it is, what is it, that afflicts us so that we are alienated from each other, from ourselves and from God? What affliction do we need to have removed in order that we might see again? But at about 7:30 last night, when I got home from the funeral that we hosted here yesterday evening, and I turned on the news… my thoughts went in a different direction. And I have to confess that I wasn’t sure that I wanted to see at all. Tell me what is wrong. The news this last week has been a hard: packages in the mail, the news out of a synagogue in Pittsburgh, I think could make us want to close our eyes and to see no more, because, Lord we have had enough! We have had enough! But I think that Bartimaeus and Jesus are here this morning, asking us, begging us, not to close our eyes; but to continue to see. And in fact maybe to see anew, to see again. Friday night I was at the Orpheum theater with Suzanne to see Anne Lamott speak about her newest book, and in her, in her presentation she offered us a quote. I could swear she said it was T.S. Eliot but I have looked, and looked, and looked. I can’t find the original source… but what she told us was, I think it was T.S. Eliot, said that putting on a new pair of glasses can change the way we see the whole world. Taking off our glasses and cleaning the gunk that has accumulated on the lenses can allow us to see the world in a whole new way, to have our site restored. Bartimaeus had been able to see at one point and something had happened to him. He lost his sight. I believe that each and every one of us are here today because at some point we were able to see. We got some glimpse of God’s dream, of God’s vision for this creation, and for our own lives, and we were set on fire. And we made some commitment to ourselves, and to God, and to this community, to show up and to search for those glimpses; to see more of what it is that God has to offer. But a steady diet of bad news, a steady diet of depressing and disheartening stories from around the world, can act like gunk on our glasses. I read this quote while I was looking for T.S. Eliot’s quote that says, “I was walking down the street with my glasses on the other day when the prescription ran out!” So maybe the prescription on the glasses we were given on that day has worn out, and we can’t see the world as God intends us to see it. So here this morning, as we stand beside Bart Emmaus in the dust, at the side of the road, I think we can ask, Teacher let me see again. Help me to turn my attention and my focus to the good things that are happening in the world. When I hear bad news, let my eyes and my ears at rest on the people who are running towards instead of away from the calamity. Help me to recognize your presence, and your, your action, your activity, in the midst of this pain and suffering. Help me to balance my diet so that I can be more well-rounded and healthy. That doesn’t mean that we ignore the bad things. That doesn’t mean that we walk away from them. But what it offers us the opportunity to do, is to approach those things that we want to stand up against, and stand up to, stronger, healthier, more whole; with the ability to act and not react, to be effective, and above all to not participate in the disruptive and divisive dialogue that seems to be tearing us apart. It’s so hard, when it we’re depleted and exhausted, to encounter a moment of injustice or cruelty and respond in a way that’s healing and reconciling. We need to be whole. We need to take care of ourselves. We need to be able to see more than just the darkness. So how do we do that? How do we find what we need to be well fed? In the forum just a few minutes ago, we talked about spending time in silence and in prayer. We talked about daily readings, devotional readings. We even talked about shifting our Facebook behavior. Now that may, for some of us, mean turning it off completely, but there’s another way to approach that I think that offers us a great metaphor here. When I open Facebook in the morning I don’t click on any of the bad news. I don’t click on the news stories. I only click on the things that make me laugh, or fill me with hope. So Suzanne is out there in the kitchen, and I’m sitting in the other room drinking my coffee and laughing hysterically, and she says, “Are you on Facebook again?” But you know, Facebook has these algorithms. And they recognize what you click on and what you skip over. And so the algorithm that Facebook has for me says send Andy funny stuff in the morning. I think there’s a metaphor in that. If all we look at is bad news then that’s all that our eyes will see. But if we start to pay attention to the beauty in the world, to the things that are life-giving, to God active in our lives and in the lives of others, we’ll get better at seeing those things. And they will begin to occupy more and more of our consciousness, so that we can walk through this world without those millstones dragging us down. This sermon, offered by The Rev. Andy Jones, at St Andrew’s Episcopal Church in Madison Wisconsin on October 21, 2018, is built around the readings for Proper 24B in the Revised Common Lectionary. So, this is a pretty surprising turn of events. James and John, the sons of Zebedee, havebeen with Jesus from the beginning. Jesus called Simon, later called Peter, and his brother Andrew, and then in the very next verses of Mark’s Gospel he calls James and John. They’ve been central to the story, key figures in the narrative. But today James and John sidle up to Jesus when no one else is looking, when Jesus is alone, and they try to talk him into a corner. “Teacher, we want you to do whatever we ask of you.” They’re trying to trap him, get them to agree before they tell them what they want. It’s surprising that these two are acting this way. It’s so surprising that when Matthew tells the story he has James and John’s mother ask on their behalf, trying not to embarrass them or make them look bad. So, what’s going on here? What are they doing? “The Son of Man is to be betrayed into human hands, and they will kill him, and three days after being killed, he will rise again” (Mark 9:31). ‘See, we are going up to Jerusalem, and the Son of Man will be handed over to the chief priests and the scribes, and they will condemn him to death; then they will hand him over to the Gentiles; they will mock him, and spit upon him, and flog him, and kill him; and after three days he will rise again’ (Mark 10:33- 34). James and John were scared. And no wonder. So are we. James and John, and we, live in a world that wants to define itself with a message of scarcity; a message that defines this world by saying that through the oppression of those that might challenge what we have, or want, or aspire to, we might become great. They, we, live in a world where there is no middle ground, where arguments seem to go from 0 to 60 in three point four seconds, and where the need to win those conflicts seems take priority over respecting the dignity of others. They, we, live in a world where human life is devalued, where people are sacrificed, where cruelty and injustice are ignored, even accepted all for the sake of winning, for the sake of greatness, for the sake of wealth, and of power. James and John were fishermen. They were home, with their people, with their family, plying their trade with their father when Jesus called them. And when they heard that call they left it all behind. Now Jesus is talking about going to Jerusalem to die. He’s talking about leaving them with no direction, alone, with nothing. So maybe it’s not so surprising that they’re grasping for here, something to hold onto. They’re going to need to take care of themselves in this hostile and dangerous world. So, they need something to shore themselves up, and to make them feel strong. They had been brothers on a mission, ready to take on the world, they need something to make themselves feel great again. Is that too much to ask Jesus? But all you seem to want to talk about is going to Jerusalem, to Golgotha, to the cross. And when pushed back, you tell us to pick up our own cross and follow you, to become last of all, servant of all, slave of all. Where’s good news is that Jesus? Where is the good news? We sure could use some today. Today, for all its similarities with that moment in the Galilee when James and John try to worm their way into a position of power at Jesus’s right and left hand, today is a different day. James and John didn’t yet know the end of the story. And even when they witness the end of the story, it didn’t make sense to them. It was so counter intuitive, so counter cultural, so subversive, that they couldn’t get it. But we, we have the benefit of almost 2000 years of reflection, of engagement, of wrestling with the cross. And we’ve done that hard work with the help of the Holy Spirit, the comforter, whom Jesus sent to remind us of all that he’s taught us, and to reveal to us the things we weren’t ready to hear there in the Galilee before Jesus’s resurrection. So, we, if we take the time to think about it carefully, know that this Gospel reading today is full of good news. The world in which James and John lived was a scary place. And this world can be a scary place. And the real danger is that we will be dragged into, that we will be subverted, into viewing the world in the way that it presents itself. James and John, when they came to Jesus behind their companions backs and tried to win for themselves a place of power, were buying in to the world view that is crippling and scaring all of us. Jesus is trying hard to offer us another way to be in the world, another way to see, another way to live, so that we’re always looking out for ourselves first, so were not always looking out for ours and our own first. Jesus is trying to remind us that we are all one, brothers and sisters in Christ, and that true life is found when we live together, supporting and holding one another up. Servant of all, last of all, slave of all… Jesus is using hyperbole here to point out just how far off base James and John are. And the fear and pain that they are feeling, the fear and the pain that we are feeling, is a symptom that we are being subverted too. Now deciding to live differently, deciding to see the world differently, to live in the world differently, doesn’t necessarily make the world a less scary place. But it does free us up to behave differently. And it frees us up to care for one another. And that care for the other has the capacity, the ability to change the world. We are called to proclaim a counter cultural, subversive gospel, that says that we are only alive, we are only living as the people that God creates us to be, when we see the other as our brother or our sister. We are only living in Jesus’s footsteps, walking the path that he trod, when we are willing to elevate an other’s needs, and concerns, and agenda, so that it is at par with our own. When we work to cut ourselves off from others and to secure a place for ourselves at their expense, we are moving into the wrong narrative and proclaiming by our words, and deeds, and actions, the very narrative that Jesus is trying to end. So, we come here this morning, looking for comfort and some good news from Jesus, and what sounds pretty scary and difficult, it turns out is, in fact, just what we came looking for. It is a way to be… in relationship with one another, in relationship with God, in relationship with ourselves that can give us peace, and courage, and a way forward, in times that are scary and dark. This morning in the forum we gathered to talk about The Way of Love: Practices for a Jesus Centered Life or for Jesus Centered Living. I talked about this a little bit last week in my sermon, and there are resources now on our webpage that will allow you to watch a video by presiding Bishop Michael Curry, describing the seven practices in The Way of Love. I would encourage you to go and watch that video and to think about the things that we might do, both as individuals and as a community, to establish and to nurture connection with one another, with ourselves, with that deep part of ourselves that we call our soul, and with the God for whom we so long. I would encourage you to take a look at those steps and to identify those things in your life, in our life, that are squeezing God out, and allowing things in that are causing us fear and pain, perpetuating the sense of darkness that pervades our lives today. There is real comfort in the good news of today’s Gospel. It takes some work. It takes some practice. We call these ways disciplines, and Bishop Curry says in his video that they are ways to train ourselves up, to live a life that reflects Jesus more fully. The good news is that we can do it, that Jesus has shown us the way. And the good news is that we have a long history of practicing these things together. The good news is that the peace of God which passes all understanding can be ours, and it is available to us. If we just her turn, turn to Jesus, turn to prayer, turn to scripture, to worship, to blessing one another through our lives, to going into the world to discover what God is up to. And to resting so that we might begin again. James and John come to Jesus this morning and ask on our behalf for a place at Jesus’s left and right hand, and Jesus said that for him to give. I don’t think we want to be at his side. I think the place where we should be is behind him, in his footsteps, acknowledging that he has blazed the trail for us. And all we need to do is follow. Rest For Your Soul… There’s a Group For That! This sermon, offered on October 14, 2018 at St Andrew’s Episcopal Church, by The Rev. Andy Jones, is built around the readings assigned for Saint Francis of Assisi. So I know there may be some argument about this, but I think that one of the greatest things about the Internet is that it allows people with unique, even obscure, interests to connect with one another and to collaborate. A hurdy gurdy is a stringed instrument, developed sometime before the 11th century, that works a little bit like a violin. But instead of being bowed, the strings are by a hand cranked rosin coated wheel it rubs against the strings. And different pitches are created by pressing keys the on the keyboard that stop or shorten strings. So, anybody in the room know someone who plays a hurdy gurdy? Imagine what it would be like if you were the only hurdy gurdy player in town, or in the county, or in your state. Where would you go for instructions on tuning, repairing, even playing your instrument. It might be pretty lonely. Well, there’s an Internet group for that. On Facebook, The Hurdy Gurdy Community describes itself as a group for hurdy-gurdy enthusiasts of all sorts, from complete beginner to expert.” And The Hurdy Gurdy Community has 1,478 members. Here’s another one. Did you read James Clavell’s 1975 novel Shogun? Did you like the movie The Last Samurai or Mulan, or are you a fan of Akira Kurosawa? Did you ever think you might like to make your own full-sized samurai armor? If so, there’s a group for that! The Facebook group Samurai Armor: Build Your Own Full-Size Replica boasts 613 members. One more than I’ll stop, but this one’s my favorite. Now I don’t have any idea who the 159 members of the Jellyfish Owners Association are. And I don’t know where they live. But I’ll bet you that all 159 of them are really glad to be able to connect with one another, and to form of a community with a common need and interest, a common vision; a community that can share ideas and help one another out. So here’s little more serious question. If you set out to create a group with a common need and interest, a common vision; a community that could share ideas and help one another out… what would be the focus of your group? Who would you want to gather? What would you call yourselves? I don’t know about you, but I think right now what I really need, and I don’t think I’m alone in this, is a group for the weary, a group for people carrying heavy burdens, for people who long for a little rest, even a little rest for their souls. So, what we call that group? I’m not sure. But I would want it to be a group with a lot of members. And it would be great if some of those members were close enough that we could gather regularly and maybe even share a meal. And you know, don’t think I would want it to be a new group. I’d want it to be a group with some history, with some time-tested ideas and practices to offer. That’s what I need. But what would we call it? Jesus is issued that invitation through the best social media that his day had to offer. He invited a big crowd of people near his hometown of Capernaum, in the region of Galilee, and each member of that crowd told two people, and each of them told two people, until sometime after Jesus’s resurrection Matthew wrote it down, and extended the invitation to us. So, here we are. And we are not a small group. Worldwide somewhere around 2.2 billion people have responded to Jesus’s invitation. There are local chapters of this group right here in Madison; communities with a common need and interest, a common vision; communities that share ideas and help one another out; communities with whom we can gather and share a meal. And we’re not a new group either. Two thousand years of history, of trial and error, of working together to respond to Jesus’s invitation, and to experience that for which our souls long… We are a group some time-tested ideas and practices to offer, and we are more than ready to share them and help one another out. So as we begin to ask ourselves, how it is we find that rest, and that rest for our souls, let’s go to us Jesus’s invitation to us. Jesus tells us that his yoke is easy and his burden is light. Clearly there’s a comparison being made, a contrast here. Jesus is telling us that we are yoked to the wrong things, and that we are carrying the wrong burdens. We need to yoke ourselves to him and to carry his burdens. So, first of all a yoke. That might not sound like a great thing, it may be that we are rethinking our decision to join this group. But a yoke is used to bind two animals together so that they can pull the same burden. And so what Jesus is asking us to do is to step into the yoke with him. So that he can help us. So that he can pull that load with us. And then he offers us his burdens. Now, let’s think for a minute about what those might be. Jesus asks us to follow in his footsteps, and we have the baptismal covenant, promises that we made. But there are some other versions of those promises, and some other ideas for how to follow in his footsteps. St. Francis, and did you really think that we can get back to Francis by this point? Francis wrote a rule of life, and people made commitments to poverty, to chastity, to proclaiming the gospel, to caring for all creatures, all of God’s creation. Francis called it a rule of life. St. Benedict before him created a rule of life, a way for people to approach living and being in the world, that would yoke them to Jesus, to help us to carry Jesus’s burdens. The reason that Jesus tells us that his burden is light, and his yoke is easy is that he’s in the traces with us, helping us to pull the load, but also because, this way of life allows us to experience life at its fullest, as the people that God creates us to be. And when we’re carrying the right burdens we find them to be joyful. Put a 50-pound backpack on, and walk around the Vilas Zoo and you’ll be exhausted. Pick up a 50-pound child or grandchild, and walk around the Vilas Zoo and you come home feeling more alive than you have all week. Jesus is telling us that the right burdens make all the difference world. This summer at the Gen. convention, presiding Bishop Michael Curry offered us a way to yoke ourselves to Jesus, and to carry Jesus’s burdens; to turn our attention to the things that give us life; and to live in a way that will lead us to becoming the people that God created us to be. The Way of Love: Practices for Jesus Centered Life. Now I know the windowsills are getting crowded in here. The back window sills still have gratitude boxes for you all to write out, what it is about St. Andrews that fills you with gratitude. But the other windowsills and on the radiators here in the front, are copies of this invitation to walk in The Way of Love. Learn: Reflect on Scripture each day, especially on Jesus’s life and teachings. Worship: Gather in community weekly to thank, praise, and dwell with God. To bless: to bless the people around us by our life and presence. Go into the world and find and experience God at work and Jesus’s presence in other people. To Rest: to take time to recharge, to reflect on the ways that these practices have enriched our lives, and built us up. And then… to begin again. Over the next several months we will pay close attention to The Way of Love. We will be offering Sunday forums to talk more about this. We’ll be preaching about it. And we’ll engage one another in these practices, and experiment to find the burdens that are most like giving each of us, so that when we come together we can find rest, rest for our souls. On this document, and I hope you all will take one home, there are links to a couple of websites with more information. And, as in all things in the church, we’re building this airplane as we fly. So some of the material will be coming out in the next few weeks and in the next month, but as they come out we will be offering them. What I hope that you all will do is to pay attention, to try some of these things on what a difference they may in your lives, and then come back here and share with one another what you’ve discovered and what you’ve learned. So this week the first step is to turn. Think of something in your week that you do reflexively, almost without thinking about it, that exhausts you. Think about something that you do in your day habitually, as a matter of rote, that wears you out and burdens you. And then, turn away from it, stop, and do something that will focus your attention and your mind on God for just a moment. Here’s what I’m going to do. and I’ll have to admit that I’ve told you that I was going to do this before. That’s why this is a cyclical pattern of behaviors, because we set out to accomplish them, and we find ourselves often right back in the scenes spot again. You pick up and start over… I am not going to turn on the news first thing in the morning when I wake up. Some time ago I switched to an alarm clock on my cell phone that’s just a series of chimes so that I wouldn’t wake up grinding my teeth stories on NPR which were invading my dreams before I had my defenses up. But now, I’m not going to turn NPR on when I get my cup of coffee. I’m not going to check the Washington Post before I get in the car to come to work. I’m going to let those things wait, and instead, I’m going to say a prayer. Oh God, keep me fit for the journey today. Keep my eyes have eyes on the goal, my feet on the path. Bring me home to rest in you. This sermon, offered by The Rev. Andy Jones at Saint Andrew’s Episcopal Church, Madison,Wisconsin, is built around the readings assigned for Proper 16 in Year B of the Revised Common Lectionary. May the words of my mouth, and the meditations of our hearts, be always acceptable in your sight, O Lord, our strength and our redeemer. So, this is Year B in the Revised Common Lectionary. We have a three year series, or cycle of readings, and in Year B, the second year, we read primarily from the Gospel of Mark. But here, right in the middle of summer, every three years, we abandon Mark for five weeks to read from a single chapter of the Gospel of John. We’ve been reading from the Gospel of John since July 29th, and on that first Sunday we started, at the beginning of that sixth chapter, with the story of Jesus feeding the 5000. A few loaves of bread, a few small fish, and well over 5000 people are fed, and there are twelve baskets of leftovers at the end of the meal. The next week, the crowd has followed Jesus even as he and his disciples and tried to escape to find some time to be apart, and to pray, and to rest, and Jesus turns to the crowd and he says, “The only reason you all are here is because your bellies are empty. You haven’t followed me because of the sign that points to who I am, and to God’s presence in the world. You’re here because you want some more food.” And then Jesus says to them. “Look for the bread that does not perish, but the bread that leads to eternal life.” And he claims to be that bread. He offers himself to the people as a way of giving them eternal life. The next week, Jesus says, “My flesh is food indeed and my blood is drink indeed,” and the Pharisees are horrified because consuming blood is against their dietary laws, the laws that set them apart from the other nations, and the very idea of eating flesh and drinking blood sends them into a frenzy. This week, as all of this comes to a head, we hear some of Jesus’s own disciples saying “This teaching is too difficult. How can we accept it?” they turned back and they stop following him. But Jesus is offering them eternal life. Jesus is offering them a way of being in the world that’s suffused with, that is filled with, a sense of the eternal; something that started at the beginning of all things and stretches to the end of all things; a way of being in the world that connects with all of that. And which, in the words that we here at the end of the service every week, brings the peace of God which passes all understanding. And yet this teaching about flesh and blood is too hard, and some of Jesus his disciples abandon him. Now we have a little bit of an advantage over Jesus’s contemporaries, because from our post-resurrection point of view, some 2000 years later, we know what Jesus was pointing towards, and we know what John is talking about, as he conveys these stories. In the beginning the Word became flesh and that lived among us. And that flesh living among us gives up its life on the cross, and becomes bread and wine, so that we might be nourished by the flesh that was the word; so that we might be filled, and nourished, and given strength, and commitment, and conviction, to live an eternal life here and now. So the whole idea about cannibalism, a charge that Rome made against the early church, doesn’t even come into our minds, I hope, as we hear these stories in the middle of every August. And it seems like a silly thing to say this teaching is too hard and to walk away because of it. So, while our post-resurrection perspectives gives us that advantage, I have to admit that I also think it causes us a completely different challenge. Jesus’s contemporaries didn’t know yet that Jesus was headed for the cross when he said these words. And John’s community was wrestling with the meaning of all of that. But we know, we know, that eating the bread and drinking the wine, eating the flesh and drinking the blood that is the word that created all things, calls us to follow in Jesus’s footsteps. Taking that word into ourselves, consuming it, embracing it, allowing it to nourish us, and become the foundation of who we are, calls us to live by that very word. I think that’s way scarier than thinking about eating flesh and drinking blood! As an example of what I’m talking about… In just a few minutes when we say the Prayers of the People, Sherry will stand here in the middle of the center aisle at the microphone, and she will pray on our behalf, “Awaken in us a sense of wonder for the earth and all that is in it. Teach us to guard its beauty and care creatively for its resources.” Those are great words, and they sound wonderful here in church on Sunday morning, but think about what we’re being called to do in that moment. Think about what we’re being asked; to pray for the strength to accomplish, and it might seem a little daunting. We’ll pray, “O God give us power to reveal Christ in word and action.” The bread and the wine are an outward and visible symbol of an inner and spiritual grace, and we are called to be that same thing to the rest of the world; by our word and action, to make Christ present, and knowable, and real, to the people around us; upholding the marginalized and the oppressed, caring for the widow and orphan, upholding the poor, clothing the naked, feeding the hungry, visiting those in prison. Eating the bread and drinking the wine calls us to live that life! And I think if we really pay attention to what we’re saying, that can be pretty scary. A little later Sherry will ask us to pray for our elected leaders. That’s way scary! And then, to strengthen all of us to be willing agents of God’s compassion? That’s really scary stuff! But what’s at stake here, what’s at stake for all of us, is eternal life. So, I don’t think I can say this often enough. I, I wrestle with people around this idea all the time. Eternal life isn’t something off in the future, something in the next life, or in the next world. Jesus is talking about a way of living here and now, that allows us to sense God’s presence in ourselves, in the people around, us and in the world in which we live. God is here. Jesus is telling us that if we can follow in his footsteps, eat his flesh and drink his blood, then we can participate in a life that’s filled with, surrounded by, lit up by God’s presence; a life that is infused with the eternal, and where we will find the peace of God that passes all understanding. Paul knows how scary and how hard this is too, and in the reading that Dennis offered for us this morning he tells us, “take up the whole armor of God so that you may be able to withstand on that evil day, and having done everything, to stand firm…” Fasten the belt of truth about your waist… put on the breastplate of righteousness… get some comfortable shoes, so that you are ready to go out and proclaim the gospel of peace. Take the shield of faith, take the helmet of salvation, and the sword of the Spirit… So, in the locker downstairs after the service… come down I’ll check out all of that stuff… Where do those things come from? How do we find that strength? How do we find that courage? The first answer is, here with one another, with the people seated around you in the pews, all of whom are struggling, working, to follow in Jesus’s footsteps; to be transformed, nourished, and sent by the bread and the wine. The second answer is that bread and that wine itself, because they are the symbol and the sign of God’s ongoing presence. And when we hold out our hands we are asking to be changed, to be commissioned, to be nourished; to be fed, and to be comforted, and reassured that we are never alone; that God will never abandon us; and that where God calls us to go, God has been before us; and that on the journey to which God calls us, God will be our constant companion. Daunting, scary, maybe, maybe, but the promise, the promise is eternal life. The promise is the Peace of God which passes all understanding, the joy that comes from becoming the people God created us to be, the joy that comes from fulfilling our vocation and finding our meaning in the truth that began with all things, and that stretches to the end. We are offered the opportunity to live in that light. So, when you come forward this morning, hold out your hands. Receive your identity. Receive your vocation, your calling, your purpose, your meaning. Receive who you are. And know that you are indwelling in God, and God is indwelling in you, and all that you could ask for is yours, in that moment. Thanks be to God.